About: Number of homes sold in Sparks for the period of Nov 2005- Mar 2010. If the number of homes for sale show us the supply of homes in the Sparks real estate market, in this post we will be looking at the market's demand side. WIIFM (what's in it for me? ): Our hope is that by showing you the supply and the demand of the Sparks real estate market you can have a bird's eye view of what's really going on in our real estate market. We have always carried with us the belief that the market's opinion is far superior than any of us so called 'experts'. Hope this helps you in your decision-making. (Mar 2010) 142 homes sold in Sparks in March 2010. (Jan 2010) As expected winter slows down sales, but it's still a lot higher than the past years (see graph below). (Aug 2009) Sparks is leading the way in sales. Prices of starter homes are strong! Ask a buyer's agent in this area. (May 2009) demand goes down by 16 homes, but demand is still strong (see graph). (Mar 2009) Sales, literally are off my graph's roof (see graph below). Highest sales since December 2005! (Feb 2009) Sales up by thirteen homes! (Dec 2008) Sales jump by more than 31 homes! (Nov 2008) After a very good October, sales dipped back to eighty-seven homes sold in November 2008. (Oct 2008) This was the farthest thing I expected to happen. Amidst the economic turmoil and financial panic--three year high in homes sold in Sparks! We cannot argue with the market. (Sep 2008) Demand continue to go up, though slightly down from the early summer months . Median price continues to slide. If demand continues to go up it'll be a good indicator that a bottom is nearing. Watch out investors! (Mar 2010) Demand, here it comes! I think demand for Sparks homes will be off my charts (literally, see graph below) come summer time. (Aug 2009) I hope I can still say that opportunities are still a lot. The $150,000 price range is getting multiple offers! (Apr 2009) Highest demand since I started tracking data back in December 2005! (Mar 2009) Sales are sky rocketing. Though median sales price is still hurting, this is a very encouraging sign that the bottom in prices might not be too far from us. (Feb 2009) I see something good happening, though the median price in Sparks is still going down, current sales is higher compared to the last few years(see: graph) if this continues the bottom might not be too far from us. (Dec 2008) I'm really encouraged by what I'm seeing. Notice the current sales is at a similar level when I started gathering numbers back in 2005 (a very good year). (Nov 2008) After having amazing sales last month, demand drops. But the overall trend is still positive, let's wait and see if this continues. 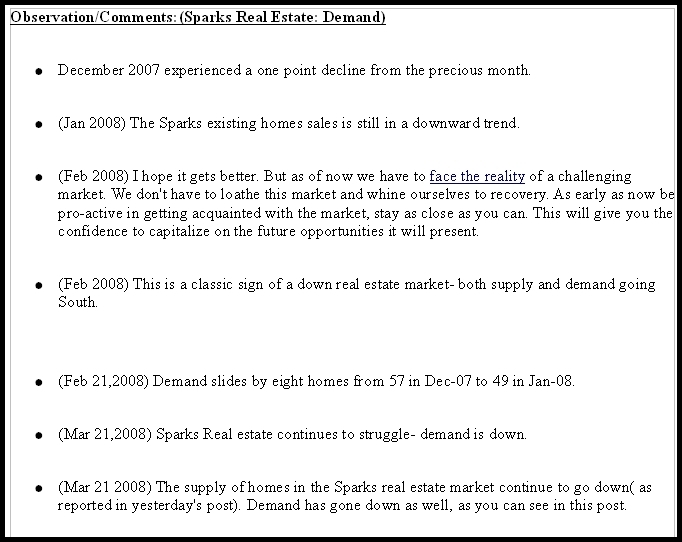 (Oct 2008) Sparks demand is in a three-year high (since Nov 2005)! (Sep 2008) If you're buying a home in the $210,000 and above price range, know that it is still a buyer's market. Take your time, but be decisive once you find what you want that fits your budget and of course, your dreams. talk about the home that's right for you. Joe:775-338-7653"
Sparks seem to have harder life than any of the cities beside, why is this? One reason may be that they have built so many new homes and though the demand is there it still seems too much for a population that may not keep up. What do you think Joe? This page contains a single entry by Reno Home Blog Team published on April 21, 2010 7:00 AM. Reno,Sparks & Carson Real Estate Market: What's happening? was the previous entry in this blog. NEW! Foreclosures and Short Sales in Reno is the next entry in this blog.